Here is my Fit Yummy Mummy review. Fit Yummy Mummy claims that it will help you lose the baby weight and get a flat stomach after pregnancy. Holly created the book to help you lose inches, tone and reshape your body, lose fat faster, have increased energy and enjoy your life more. Best of all, this plan will help you gain more self confidence through sculpting and reshaping your body. So does it work? Holly’s Fit Yummy Mummy program is built on sound nutritional and workout principles. If you follow it, it will help you lose your baby weight. But you must stick to the program, there is no magic here. If you do what Holly recommends and are thorough with your eating habits and workouts, you’ll definitely be able to reshape your body into a much leaner fit version. Holly starts the book with a section on goal setting, because it is crucial to know what you are trying to achieve. Next she moves to some important basics about your metabolism. Then she gets into the meat of the program… the food. Her program is a lifestyle change based on whole, clean food. You won’t be hungry on this plan because she recommends eating at least every 3-3 1/2 hours. The nutrition plan is very complete, yet easy to follow if you simply plan ahead and chart out what you’re planning on eating in advance. She recommends cooking meals in advance so you aren’t a slave to your kitchen. There is a portion of the book about eating out, snacks and cheat meals, and explains exactly WHY you should follow the plan as well as a road map to reach your weight loss goals. What I really like about the program is that it isn’t a recipe for deprivation. Holly explains how to eat at restaurants healthfully to stay on track. There aren’t any banished foods, she just explains mindfulness about what you eat and WHY you should avoid junk food, and alternatives. The section about slip-ups is genius because it explains why you shouldn’t worry if you aren’t perfect, and what to do to immediately get back on track. I really like the section about alternative foods to eat as snacks instead of hitting the junk food. Since it is a lifestyle change program, there aren’t any gimmicky concepts (no liquid diet, no strange foods, no punishment). The nutritional section is solid, and applicable. I could go in my kitchen tonight and recreate the meals without breaking a sweat. Next stop is the workout program (where I hope you break a sweat). I really like how Holly explains why being a “cardio queen” is a bad thing, and how you should change it. She explains resistance training and why it is essential for getting the lean, fit body everyone seems to be trying for (I’m not at a loss for why, Holly looks great). The workout program is a very effective interval-based training program. There is a 16 week workout schedule that you customize based on four different formats based on your own personal goals. It looks complicated at first but really isn’t as hard as it looks once you reach the section that contains photos of Holly doing the exercises. I would definitely print this part out to refer back to it. One really great part about the workout section is that you can do these moves with minimal time and equipment, so they are really great for fitting into your already jam packed schedule (baby napping? do planks!!). You can get these workouts done with a mat, simple dumbells, a bench or a step, swiss ball and medicine ball. That is super minimal when you compare it with a bunch of hulky gym equipment. The index contains goal setting worksheets, how to create your own workout journal, sample menus, information about food labels, grocery shopping survival tips, a fat loss troubleshooting checklist, and a whole bunch of extra exercises in an archive with full instructions. Also, this program comes with tons of bonuses. 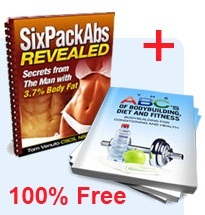 Holly includes 9 bonus ebooks; a cellulite cure, Fast Easy Meals, Meal Plans 101, 6 Minute Circuit Workouts, a 7 Minute Quick Start Guide, the Dress Size Reduction Diet, the New Mom’s Jumpstart, the Stylish Mom ebook and an additional Nutrition Guide. To top it off, there is an audio book about getting organized so you can fit fitness into your day without losing your mind. Bottom line, this is the complete package for changing your body and getting a lean, fit physique you can be proud of. This isn’t an easy program. It is simple, but it really requires follow through. You are aiming to get in the best shape you’ve been in. That isn’t an easy goal to reach. Holly provides you all of the tools to get where you want to go, but you must, must follow the program. Other than that, I strongly recommend this plan for getting rid of your pregnancy weight. Holly Rigsby has been incredibly thorough and you will definitely benefit if you pick up this plan and follow it to the letter. I hope this Fit Yummy Mummy Review was helpful. I strongly recommend that you check out the Fit Yummy Mummy program to get rid of that pregnancy weight.